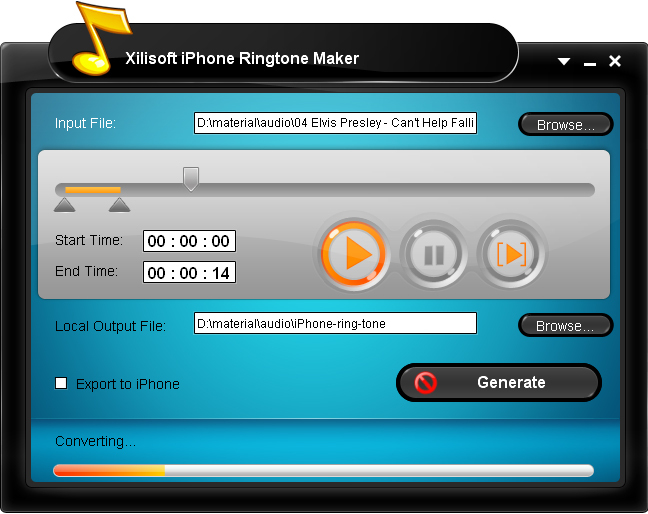 Xilisoft iPhone Ringtone Maker helps you make iPhone ringtone by converting multiform video/audio files including AVI, MPEG, WMV, DivX, MP4, H.264/AVC, AVCHD, MKV, MP3, WMA, WAV, RA, M4A, etc. to M4R iPhone ringtone, and transfer the ringtone to iPhone directly after conversion if you want. Moreover, you can also clip any music segment from video/audio file and turn it into iPhone ringtone. And it fully supports iPhone 3GS (iPhone OS 3.0). ...... and it also an iPhone ringtone transfer software to transfer the converted M4R ringtone to iPhone directly. 3. If you just love a clip in a music file, Xilisoft iPhone Ringtone Maker helps you set exact start time and end time of the segment and turn it into iPhone ringtone. Qweas is providing links to Xilisoft iPhone Ringtone Maker 1.0.17.0625 as a courtesy, and makes no representations regarding Xilisoft iPhone Ringtone Maker or any other applications or any information related thereto. Any questions, complaints or claims regarding this application Xilisoft iPhone Ringtone Maker 1.0.17.0625 must be directed to the appropriate software vendor. You may click the publisher link of Xilisoft iPhone Ringtone Maker on the top of this page to get more details about the vendor.